I know a friend who had been through an abusive relationship for many years and stayed in it because she felt she had no other choice. She convinced herself that things weren’t that bad and tried to hang in the relationship by looking at the glass half full. Unfortunately, it took her many years of being in the abusive relationship before she finally had the courage to face the reality of her situation. I wanted the book to show women in abusive or controlling situations that it would be better to get out of a bad relationship early and trust God to help them find them a suitable soul mate. Julie Peterson sat alone on the faded stone bench shrouded under the shade of the rare Silver Linden tree in the backyard of her parents’ house. This was her private sanctuary, a place where she could secretly admire most of the two-acre backyard, which boasted a swimming pool lined with elegant mosaic tiles, a tennis court, and a guest house that could accommodate five people comfortably. When her parents had company over, it wasn’t uncommon to see guests stopping to check out the koi ponds, exotic flowers and rare species of trees that offered plenty of cool shade. This backyard could easily rival the best botanical garden in town. Most days, she loved to be out there alone. From the house, this particular bench remained hidden, surrounded by an audience of lavender plants, and Julie found it to be the perfect getaway when she needed time to relax or do some serious soul searching. She closed her eyes and inhaled deeply, allowing the soothing fragrance of lavender to refresh her senses. Julie stretched her neck and arched her back to get the kinks out. For the first time in a long while she was able to put every worry out of her mind, even if only for a short hour, and just listen to the sound of her own breath. There were no worries about appointments, phone calls and questions and all those wedding plans. But, even though she was enjoying her little respite, she couldn’t help but feel those things were just waiting around the fringe of her mind for an opportunity to bound back into the center and take up all her energy. It began to make her chest feel tightened as if she had slipped into an invisible corset. Shaking her head, Julie tried to suppress the images and little ideas screaming, “Look at me! Pay attention to me!” falling right out of her ears. She even tried distracting herself by looking at the beautiful flowers in bloom all around the yard. But the arboretum-like beauty surrounding her still failed to quell the nagging voices inside. As she indulged in the landscaping of her future house, her cell phone rang. Looking down at the number, she saw it was her friend Danielle. She hadn’t spoken to her much in the past couple of months, and she missed her. But, James would be arriving soon, and he always had such a fit if Julie were talking on the phone when he was around. Sighing sadly, she let it go to voicemail and would try and answer it later. Then, she shut the phone off completely so it wouldn’t ring while she was with James, possibly leading to any kind of argument. He liked to argue a lot these days. It had to just be the stress of the wedding, the idea of taking on a wife and new responsibilities had to be scary for him too. At least that was what Julie was telling herself. But she tried to remain optimistic, hoping after they were married he’d see how easy she was to live with and how she was good wife material, that his responsibilities wouldn’t be as heavy because she would be there to help shoulder the load. Not that either one of them had the normal worries other newlywed couples had. They both had generous family trusts, and both their parents were alive, healthy and very wealthy. That should make everything easy, right? She didn’t take the time to answer her own question. She didn’t want to. The answer was a little bit too scary, too real. Standing up, Julie brushed off her skirt and headed into the house just as James pulled his car up to the front door. He was there to take her to lunch. Julie would suggest Wang Ho for some Chinese food. She was dying for their egg rolls and the little bit of excitement that comes with cracking open a fortune cookie, but she knew James would say no. He liked to say no a lot these days. It would be off to the country club, again, to watch James shake hands with half the members and trade jibes with the upper crusts while she stood back and smiled. It’s just nerves, she thought, as she climbed into his car and received a quick peck on the cheek in between a phone conversation James was having with some client of his. He held his finger to his lips to indicate she needed to be quiet. And so she was, all the way to the country club. She didn’t even have a chance to suggest Chinese food. The scenery zipped past her. Julie didn’t even notice the other cars on the road, the traffic lights, and the people walking. They were all there but not important or even interesting to her. Her mind was desperately trying to think of a reason she was in this car. But Julie could barely come up with one. She settled on the fact that she was hungry, and James was taking her someplace where there was food. Not just any man, but her fiancé, the one who should be the most important person in her life besides her family, was taking her some place to get food. It sounded so pathetic, but the fact it was all she could come up with made Julie shrink in her seat. 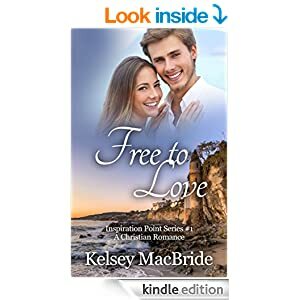 Kelsey MacBride is the author of several books including Choices of the Heart, Desires of the Heart, Passions of the Heart, and Redemption of the Heart. Kelsey is a longtime resident of Southern California and enjoys traveling and cooking.